The first Ruby Hutchison Memorial Address was given by the then Prime Minister, Bob Hawke, at the National Press Club, Canberra on 13 March 1987. The Foundation for Effective Markets and Government is the custodian (the legal name holder) of the Address and this is fitting as it was initiated by two FEMAG members, the late John Wood, then head of the Consumer Affairs Division of the Attorney General’s Department (subsequently the Federal Bureau of Consumer Affairs) and Robin Brown, then Director of the Australian Federation of Consumer Organisations (now the Consumers’ Federation of Australia). 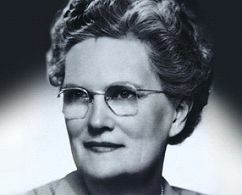 Ruby Hutchison was elected to the WA Legislative Council in 1954 and was the first female councillor in Australia. She was the second woman in WA to be elected to the Parliament, the first being May Holman who had been elected to the Legislative Assembly. At the time Ruby was elected, she was aged 62. Ruby was the eldest daughter in a family of 10 children and was born in Footscray in 1892. She was married and widowed with 7 children by the age of 30. She enrolled in University of Western Australia studying Social Welfare and Public Administration (after her children had grown up). While a Member of Parliament, she was said to be a fierce advocate for the abolition or at least reform of the undemocratic voting system for the Legislative Council (then based on real estate held) and was part of a push, eventually successful in 1957, to have women appointed as jurors. Her interests were in youth affairs and promotion of women’s' rights. She also campaigned for equal opportunity for people suffering epilepsy and intellectual disability and was a founder of the West Australian Epilepsy Association and the Nulsen Haven which provided accommodation for intellectually disabled children. She did not seek re-election in 1971 and at that time she was aged 79 years. By that stage, voting for the Legislative Council had become more equitable and apparently in her last speech on 26 November 1970, she commented that 22,000 young women of 18 years of age would be eligible for the first time to vote at the 1971 election. Concerned by the increasing number of complaints about poor quality goods and services in the post war period, Ruby began researching ways to establish a consumer protection organisation in 1957. She was instrumental in founding the Australian Consumers Association (ACA) – now known as CHOICE – in 1959, and the first edition of CHOICE magazine was published in April 1960. She was also a campaigner for Australians to buy Australian products. Ruby Hutchison’s interest in the ACA continued until her death in 1974 at the age of 82. How the RH Address began - this is Robin Brown’s recollection of its initiation. “In 1987 John Wood was head of the consumer affairs division of the Attorney General’s Department and I was head of the national peak body of the consumer movement, the Australian Federation of Consumer Organisations (now the Consumers’ Federation of Australia). To lift the profile of consumer policy nationally, amongst other things, he and I had been kicking around the idea of an annual World Consumer Rights Day address for a few months. We also wanted to have a more prominent federal agency responsible for consumer policy and programs. We thought that if we could possibly get the PM to be the first orator we just might work into the process the proposal for a federal agency. The question of what to call the address exercised our minds. Syd Einfeld was, in our view, the most successful consumer affairs minister and Lionel Murphy was responsible for major developments in consumer protection law, so naming it after one of them seemed appropriate especially since using either name would ensure political prominence. Syd was still alive and Lionel had died so perhaps a memorial address for the latter was more fitting. However, Ruby Hutchison, as one of the key founders of the Australian Consumers’ Association, was a clear option and as women had really been the early consumer advocates through housewives’ associations, the CWA and the like, naming the address after a woman seemed very suitable. The clincher came though when John discovered that Ruby had been a protégé of Bob Hawke’s uncle, Bert Hawke, who, as Premier of WA, appointed her to the Trade and Industries Protection Council. We were sure Bob would be attracted. So, I sent off the invitation and John worked within the bureaucracy and it came to pass that the PM delivered the first address on 13 March 1987 and, as a PM’s speech ideally has to have one or more announcements, he announced the establishment of the Federal Bureau of Consumer Affairs (FBCA). I was more than a little chuffed to introduce the PM and thank him with the gift of a tennis shirt AFCO had had emblazoned with the words ‘Australia’s Number One Consumer’.